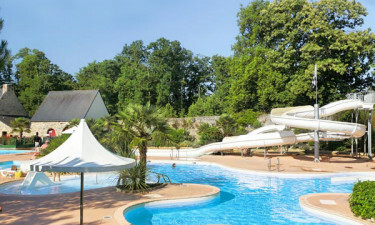 Camping Château de Galinée - Enjoy your camping holiday at this wonderful camping site in Bretagne. Château de Galinée defines camping luxury. To appreciate what this holiday camping site has to offer, you can learn more by speaking with a representative of Lux-Camp. Interesting and captivating leisure activities. Visitors can choose to rent a luxurious mobile home. There is a host of sports and pastimes to experience when frequenting this luxury camping destination. 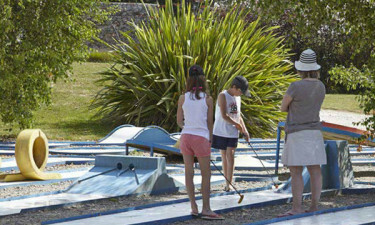 These include miniature golf, swimming in an open-air pool, tennis and table tennis. Activities that are only a short distance away such as hiking, bicycle rental, sailing and surfing are other possibilities. This arises from the fact that Château de Galinée is found quite close to the French coastline. Families can be rest assured that their young ones will remain occupied during their stay. Playgrounds and open-air parks are offered while an animal farm is one of the most popular attractions; children can have fun feeding a selection of cute and furry creatures. A baby and toddler changing room is located within Château de Galinée and these are all wheelchair-friendly locations. Another beneficial aspect of this holiday camping site is that many of the modern conveniences that visitors have come to rely upon are found here. Wireless Internet is available and there is a dedicated power circuit for each of the 273 pitches. There are waste disposal locations for a mobile home and washing machines (along with a tumble dryer) are made available to guests. There is a restaurant to be found within this luxury camping site. This eatery has a very sleek and modern appeal while it is very relaxing. An outdoor terrace provides a tranquil dining experience and there are 4 computers for online access while visiting. There is a takeaway menu for those who desire to eat from the comfort of their pitch. 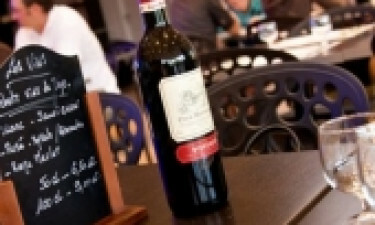 A bar that provides tasty drinks and snacks is found within the restaurant. A campsite shop is found within what was at one time and old chapel. Here, guests can purchase toiletries, newspapers, gift items, camping essentials and warm bread. This small store is open every day of the week during the peak tourist season. Barbecues can also be rented from this area on a daily basis. These are but a handful of the aspects which make Château de Galinée an ideal spot for those who enjoy luxury camping at a highly economical price. Those who hope to learn more or wish to make an enquiry in terms of bookings are encouraged to contact Lux-Camp directly.